OPRO, the world’s largest manufacturer of the most technically advanced mouthguard, today announced the renewal of their long-term partnership with professional Super Rugby team, the Gallagher Chiefs. Hailing from Hamilton, New Zealand and two-time Super Rugby Championship winners, they became the first ever Super Rugby franchise to beat an international team in 2016 against Wales. 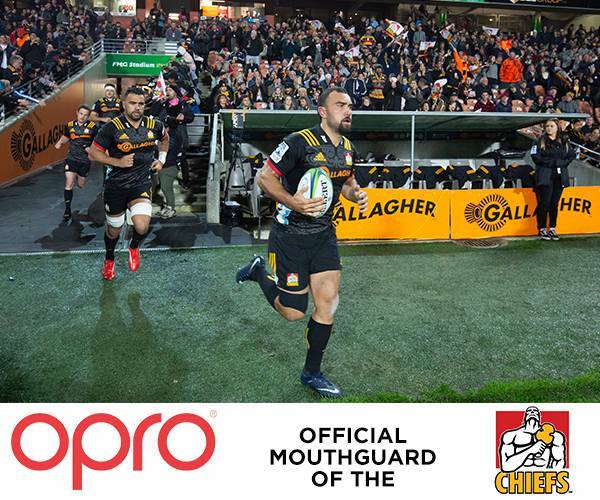 As part of their partnership, OPRO will continue to supply the Gallagher Chiefs with the very best in mouthguard protection. OPRO Chief Executive Officer David Allen commented: “We are delighted to extend our partnership with the Gallagher Chiefs as one of the most prestigious clubs in the world. “OPRO have been involved with the sport of rugby for over 20 years. New Zealand are the most acclaimed nation in World Rugby and we’re proud to provide their teams with the ultimate in terms of comfort and protection through our mouthguards”. Chiefs Rugby Club, Commercial Manager, Sean Austin also commented on the partnership renewal: “It is great to be able to extend our partnership with OPRO. The safety and wellbeing of our players is paramount and wearing OPRO mouthguards is an important part in achieving this”. OPRO serves as the official mouthguard partner of a number of professional sporting organizations, including New Zealand Rugby, Australia Rugby, England Rugby, USA Rugby, American Youth Football and the UFC.